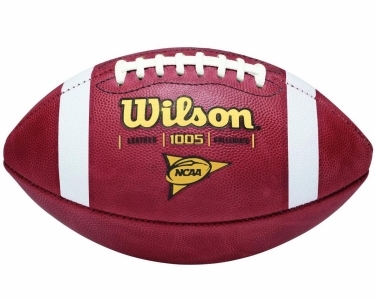 The Wilson F1005 NCAA Game Ball is designed for collegiate competitive play and offers a host of features to provide you with the best all-purpose football available. The new, improved 899 WE leather with tanned-in tack and deep pebble design combined with the 1005 small pattern and deep channels provide great gripability. Wilson's advanced Accurate Control Lacing System (ACL) replaces traditional laces with thick, pebbled composite leather laces, providing a softer, more gripable feel which translates to better control. The composite grip stripes ensure that no matter where you grip the ball--even if it's on the stripes--you'll always have control. Improved Wilson 899 WE Leather with tanned-in tack and exclusive deep pebble pattern 1005 "small" pattern - easier to grip and throw Now with ACL? lacing Dual sided lace reinforcers Wilson exclusive Grip Stripes. Leather: Exclusive Wilson leather with deeper pebble and firmer texture; look for the "w" on the ball. ACL Laces: Patented ACL: (Accurate Control Laces) made of pebbled compsite leather, provides 174% more grip than traditional laces.